A recent Overdrive article written by Kevin Jones details some varied opinions on the trucker shortage. Sales of diesel particulate filter retrofits for in-use, on-road, heavy-duty diesel vehicles operating in California remain lower than the state’s projections, according to the results of a survey released today by the Manufacturers of Emission Controls Association (MECA). The total number of verified DPFs sold by MECA member companies for diesels operating in California in the first half of 2013 was 3,508 and includes both passive and active DPFs. Under the California Air Resources Board’s truck and bus regulation, the agency projected that approximately 59,500 DPFs would need to be installed this year to meet the Jan. 1, 2014 compliance deadline for 2005-06 model-year engines. The amount of freight moved in June as measured by one gauge moved barely higher after surging in May, but it still managed to hit a record high. The American Trucking Associations’ advanced seasonally adjusted For-Hire Truck Tonnage Index increased 0.1% in June from the month before after increasing 2.1% in May from April. The May hike was revised slightly downward from the 2.3% gain ATA reported on June 18. In June, the seasonally adjusted index equaled 125.9 versus 125.8 in May. June 2013 is the highest level on record. Compared with June 2012, the index surged 5.9%, which is robust, although below May’s 6.5% year-over-year gain. 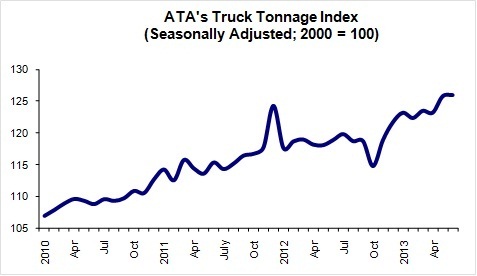 Year-to-date, compared with the same period in 2012, the tonnage index is up 4.7%. Traffic congestion in May increased 9.3 percent nationally from May of last year, says the monthly Gridlock Index from Inrix, who says the increase is an indicator of a strengthening economy. Inrix says its data is in line with other positive economic indicators in the month, including increased retail sales month over month and a spike in auto sales. The average trip in the 100 most populated metropolitan areas in the country took on average 7 percent longer this May than last May, Inrix says. From its congestion data, however, Inrix does say the recovery may be happening at different paces regionally, as metro areas in the western part o the country saw nearly 15.7 percent increase from May 2012 in traffic congestion, while the Northeast saw an 11.2 increase, the Midwest a 9.1 percent increase, and the South a much smaller 2.4 percent increase.